Denmark-Vietnam relations have enjoyed strong development in the past years, especially since the two countries established strategic partnership relations in climate change, energy, environment and green growth in November 2011 and signed Comprehensive Partnership Agreement in September 2013. 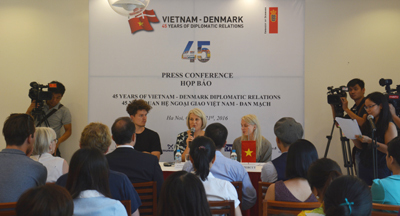 On the occasion of the 45th anniversary of the two countries’ diplomatic relations (November 25, 1971- 2016), Vietnam Business Forum interviewed Ms Charlotte Laursen, Danish Ambassador to Vietnam, on the achievements in the relationship of the two countries, as well as the development orientation for the future. Nguyen Mai reports. Would you please tell us some achievements of diplomatic relations between Vietnam and Denmark over the past 45 years? Among the major historical events is of course the early Danish recognition of Vietnam in November 1971 and the opening of a Danish embassy in Hanoi in 1980. In the following years, Denmark supported Vietnam with loans to assist in rebuilding Vietnam, and we fostered during these critical times a friendship that became the starting point of the close partnership we enjoy today. First, we can be proud of the impressive results in our long-term bilateral development cooperation and our important contribution to poverty reduction, economic growth and sustainability in Vietnam. 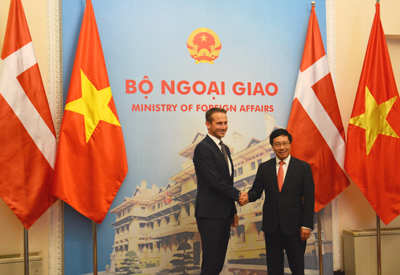 Denmark has been among the largest of all bilateral contributors of official development assistance (ODA) to Vietnam, and in Denmark, our cooperation with Vietnam is often referred to as one of the most successful development partnerships we have had globally. Second, with the Vietnamese government and on basis of the very positive socio-economic development in Vietnam, we have realized a successful transformation of our relationship from traditional development aid to a broader partnership. With the signing of the Comprehensive Partnership Agreement in 2013 during the Vietnamese state visit to Denmark, our bilateral cooperation is expanding and deepening in all areas. Thirdly, I will mention that our bilateral trade is growing at rapid pace and still holds great potential. Vietnamese export to Denmark increased by 20 pct. in 2015 compared to 2014, and for Denmark’s part, we have now the highest export per capita to Vietnam among the EU-countries. Now more than 130 Danish companies are present in Vietnam, and there is still a growing interest from Danish companies to invest and set up production in Vietnam. I am proud of this because it affirms that Denmark possesses the solutions to underpin Vietnam’s stated ambitions to have sustainable growth, for example in food & agriculture and in green growth, but also because I believe that we – and Danish companies in general – are perceived as very reliable partners. As a new Ambassador to Vietnam, how would you feel about Vietnam and the people? For me it has been very fascinating to see the rapid and impressive changes in Vietnam since I was posted here around 10 years ago. Personally, the many fantastic experiences I have had with Vietnam have given your country a special place in my heart. And that goes for many Danes. We admire your determination and are deeply impressed by the tremendous economic growth and social development you have achieved over the past decades. Your hard work and achievements are an inspiration to all of us. And on top of that comes the open and friendly people, the beautiful nature and one of the world’s best cuisines! I do, however, also share the concern held by most Vietnamese and including the leadership, that’s it’s time to step up efforts to mitigate the environmental costs of the rapid economic growth and pursue a more “green” growth-model so to speak. What policies have Denmark adopted to strengthen business connections of the two sides and to gain the most benefits from the Free Trade Agreement between Vietnam and EU scheduled to be signed in the coming time? Well, Denmark will remain committed to taking part in Vietnam’s development including with business support instruments. Under the framework of our Comprehensive Partnership, trade and investment on a more equal footing in all possible areas will be given high priority. I believe Danish strongholds can contribute significantly to sustainable and competitive growth in Vietnam in the coming years based on Vietnam’s goals and plans. Danish companies boast strong competencies in agriculture, food safety, green growth solutions, waste management, maritime shipping and logistics, where Vietnam also has high demand. 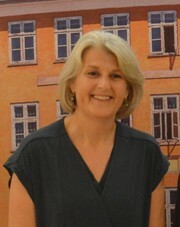 To facilitate the establishment of partnerships between Danish and Vietnamese businesses, particularly in light of the EU-VN FTA, we have employed a number of aid instruments, for example Danida Business Finance (mixed credits), new so-called Strategic Sector Cooperations within food safety, environment, education and health, as well as a new Danida Partnership facility. We also expect to continue our cooperation on energy efficiency in the industrial sector and buildings in Vietnam. With this purpose, the Danish Minister for Energy and Climate plans to visit in March next year. We have also put in place a fast and efficient visa processing system for selected companies to enjoy fast-track business visas and we expect to increase the number of companies governed by this policy every year. However, I do also see a need for stronger enforcement of the regulatory framework in Vietnam, to create an enabling environment for business and investments in order for both Vietnam and the EU to reap the full potential of the new EU/Vietnam FTA. In this respect, it’s good to see that the government is committed to stepping up efforts to improve transparency, consistency in interpretation of rules and regulations. What are you going to do to continue deepening the comprehensive partnership between Vietnam and Denmark? What is the support of Denmark to Vietnam in the coming time? For example, right now we are following up on the recent visit to Vietnam by the our Foreign Minister where a lot of concrete initiatives for further cooperation in all areas were discussed with PM Phuc, DPM Minh and MPI Minister Dung. These will certainly be incorporated into an ambitious joint Partnership action plan for 2017-2018 that we will develop together with MOFA and line ministries over the coming months. I can say that we expect to continue our support for agriculture, food safety, education, health, green investment and initiate new support to energy planning. Also, we have a high interest in exploring new potential areas for stronger cooperation, including within tourism and the maritime area in a broad sense. Relevant mechanisms including political consultations, high-level visits, joint-governmental committees on trade and investment, business instruments will be used to advance cooperation in these areas. At the same time, we also desire to continue supporting the civil society and freedom of expression that are so fundamental for the free flow of ideas and creativity - and thereby Vietnam’s aim to build a more innovative and knowledge-based economy and society.